I was never this lucky even when I had beginners' luck on my side. The other night, I guy named Charlie M, from North Carolina, had a $125,000 winning streak that started just minutes after he registered at Miami Club Casino. Miami Club has a great selection of video slots from Wager Gaming and Charlie tried lots of them before he got lucky with Black Magic. The Halloween-themed slot paid out almost $20,000 from two bonus game hits. 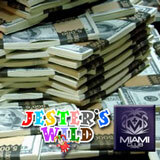 Charlie switched to Jesters Wild, the newest slot game from WGS. He had increased his bet to $150 when a Spin Up Your Win bonus came good and Charlie was rewarded with a $48,000 result. Charlie ended the night with more than $125,000 in cash, plus more than 1,000,000 comp points that promoted his VIP status to the top Millionaire's Row category. The Manager of Miami Club, Stephen Vaughan, said he's rarely seen a result like this. Miami Club Casino welcomes new players with up to eight $100 deposit bonuses. It offers dozens of online casino games from Wager Gaming and is known around the world for its daily and weekly slots tournaments and blackjack tournaments.